The Berkeley Institute Alumni will host the Annual Green and Gold Ball on Saturday, April 8th at Hamilton Princess and Beach Club with cocktails to be served at 7.00pm and the dinner at 8.00pm. A spokesperson said, “We are inviting all Berkeleyites to attend this scholarship fundraiser ball in aid of the Class of 2017. “Get your dancing shoes ready along with your colours to represent your house! Which class will have the best dance? and which house will have the best chat? “All proceeds will be used to provide scholarship opportunities to graduating seniors of The Berkeley Institute Class of 2017 to future their educational pursuits. 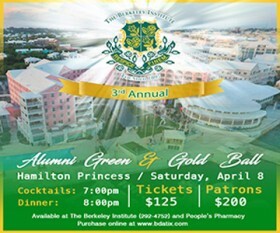 “Let’s see which house will have the most alumni in attendance…Green House or Gold House! Tickets are $125 for general and $200 for patrons available at The Berkeley Institute, People’s Pharmacy or bdatix.bm. For more information please contact greenandgold@berkeley.bm.